If you want to spend a week this winter in a serene setting in a small village acquiring essential winter skills at a skiing centre, then look no further. This is a real treat for those of you who love winter sports but don’t like crowds, as we are going to a small skiing centre in Macedonia, a country rarely visited by tourists in the winter. January and February are a perfect time to join us on a trip to the mountainous region of western Macedonia, where you can enjoy winter activities without being surrounded by the usual crowds – a familiar scene in larger skiing centres around Europe. 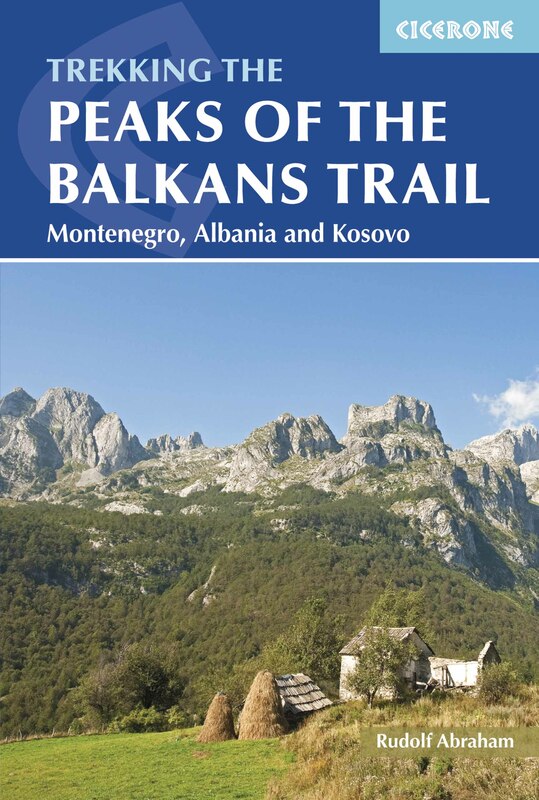 Hiking the Balkans is taking you to Mavrovo National Park, where you can challenge yourself and learn new skills that will help turn all your subsequent outdoor winter trips into unforgettable adventures. Whether you are an intermediate skier or you have never hopped on a pair of skis in your life, this is a trip for you. 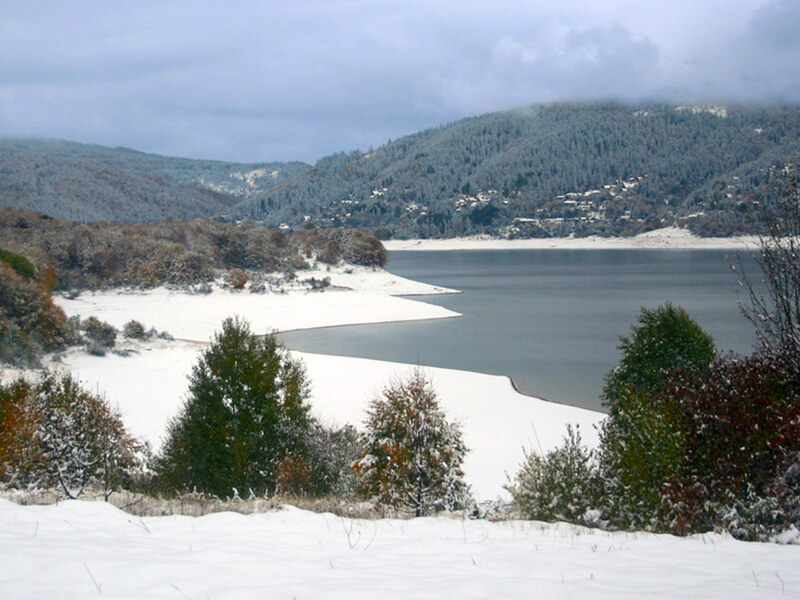 Mavrovo National Park is a huge highland area in western Macedonia, and comprises 52 peaks over 2,000 m (6,560 ft) above sea level, including the highest point in two countries: Macedonia and Albania – Mount Korab, which is 2,764 m (9,069 ft) high. This national park is home to two endangered mammals – the Balkan lynx and the brown bear. 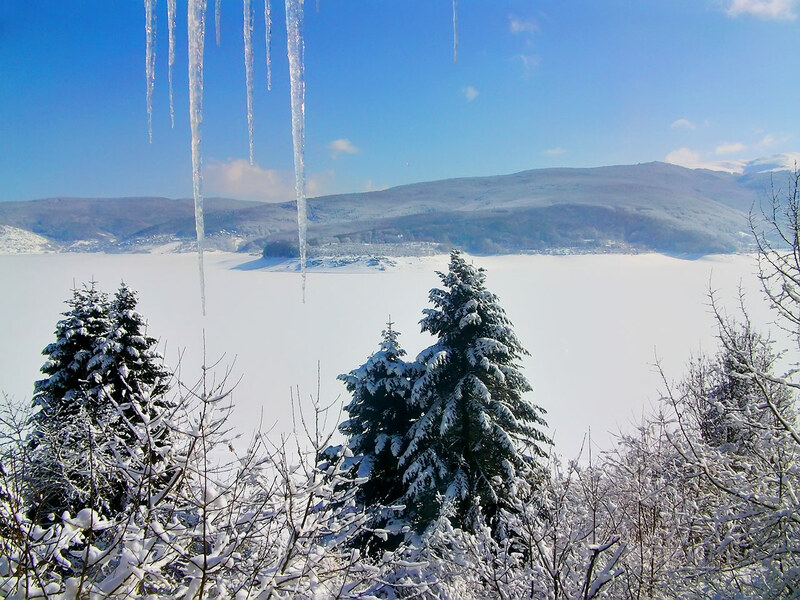 We will be spending 5 nights in the village of Leunovo, in a B&B with a view of a frozen lake. We are likely to be the only guests there and we will have access to a kitchen, so we can learn how to cook Macedonian dishes with our hosts. On a day-to-day basis we will have breakfast at the B&B in the morning and we’ll have lunch in one of the taverns on the slopes. In the evenings we can either go out for dinner or stay in the B&B. At night there is little light pollution, so we will be able to see stars and constellations if the sky is clear. We are staying at altitude of 1,100 m (3,609 ft), in a village with less than 100 houses and only one hotel. We will have our own transport to the chairlifts, which are 20 minutes’ drive away, but we will manage to escape the usual touristy fuzz of a skiing centre. A short walk from our B&B is a five-star hotel with a spa, which we can use after a long day of skiing. However, we have a full programme for the evenings, which includes viewing local films and having discussions about history, politics and the different cultures of the Balkans. During the first five days, which will be spent around the skiing resort, beginners will have the opportunity to take their first skiing lessons, while the other enthusiasts can hit the slopes of Mavrovo. The average snowfall at this time of year is 70 cm, and there is a network of 15 pistes, a few for each level: beginners, intermediate and competitive. The resort has 12 lifts (3 chairlifts and 9 ski-lifts), which offer skiers 700 m (2,300 ft) of vertical descent. The highest point of the lift is 1,589 m (5,213 ft), the vertical drop is 700 m (2,300 ft) and the bottom point of the lift is at 1,159 m (3,803 ft). Skiing equipment can be hired for as little as €15 per day, which includes skis, ski boots and poles. The skiing centre also offers the possibility of cross-country skiing. The most famous trail, called Quiet Valley, is 7.5 km (4.6 miles) long, and the total length of the cross-country trails is 30 km (18.6 miles). Our winter trips are especially welcoming for beginners and skiers who want to improve their skills with a private or group instructor. The prices of these services are very affordable, so it is a great opportunity for those of you who want to try skiing but don’t want to spend a fortune. The area we are visiting is culturally very rich, and we will be seeing one of the most renowned monasteries in Macedonia, dedicated to St. John the Baptist. According to legend, the history of the monastery begins with the miraculous icon that is still kept there today. At the end of the 10th century a monk named John lived there. Once, in the forest, near a spring, John saw a light among the trees which rose up to the sky. When John approached the light, he saw a hovering icon depicting St. John, surrounded with radiance. John fell to his knees, thanked God and resolved to build a house for the icon – a small chapel, where he prayed every day. Over the centuries the site grew, but it was destroyed under Ottoman rule in the 16th century. In the 18th century it became home to a larger community of monks, and it was then that the monastery took the shape that we can see today. Throughout the trip we will be tasting local Macedonian dishes, but on day six we will take a special trip to eat at a very famous restaurant recently featured in Vogue. The whole trip is a true culinary experience, and there will be plenty of opportunities to taste some local wines. Day 1: We will arrive in Skopje to have lunch and a stroll in the old town, one of the largest ottoman style bazaars in the World. We stay in Skopje over night and in the morning we’ll go to the ski resort, an hour and a half away from the busy capital city of Skopje. Day 2: On day two we’ll have the whole day for skiing. For lunch, we can sample some traditional local food in the restaurants on the slopes. In the evening we’ll watch a short movie about avalanches and have a brief informative session about avalanche safety. This is an introduction to our next day’s afternoon session: basic avalanche training – in the snow! 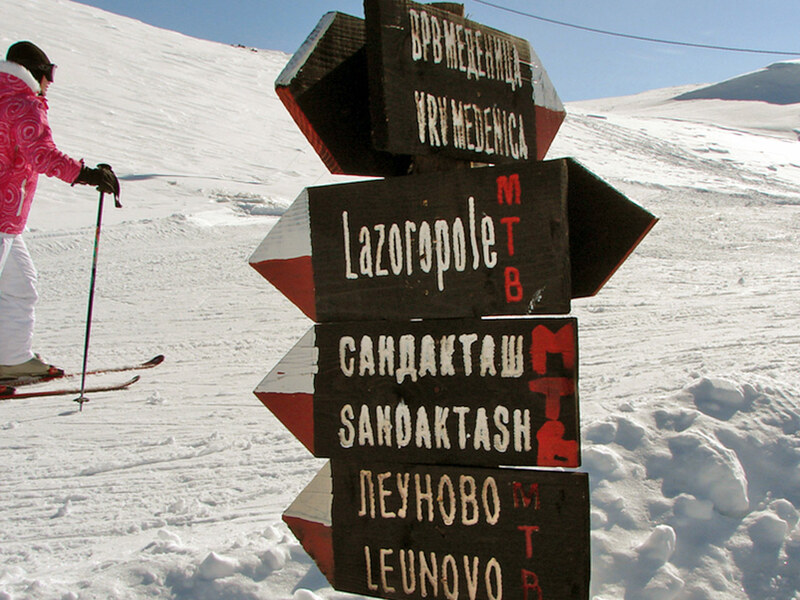 This, as well as all the other outdoor sessions aside from skiing lessons, will be led by our guide, Meto Chilimanov. Meto is an active alpinist in the Macedonian Alpine Climbing Federation, and dedicates some of his time to teaching young children to climb. He is the co-organizer of the first avalanche safety camp in Macedonia, and also teaches avalanche safety as part of the UIMLA course for mountain guides. Day 3: After a morning skiing session and a warm lunch in one of the local taverns, we will have a basic avalanche course, both theoretical and practical. We will learn what to do if an avalanche occurs. We will find out how the snow forms, how the snow crystals change, how they bind, and what is it that makes snow so much fun and so mysterious at the same time. We will also check out basic avalanche equipment and will learn how to use the avalanche tracing device, probe and shovel. 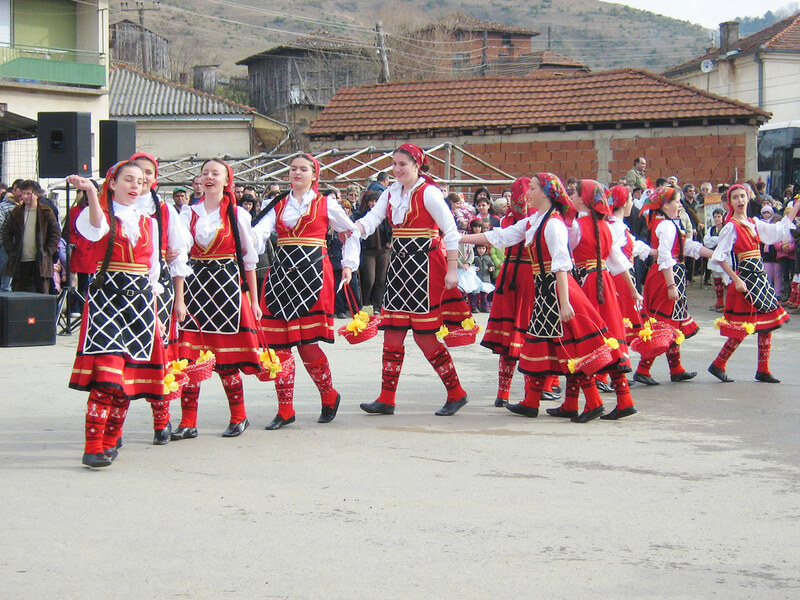 Day 4: Day four is the last day we spend in the village of Leunovo surrounded by forests of beech and pine trees. The morning is still reserved for skiing, but in the afternoon you will have the opportunity to learn how to build your own snow house. We will learn several different techniques to construct a refuge for the night, making a snow pit and an igloo by using the materials that nature provides for us. Day 5: We will start day five with a short transfer to the village of Janche, going deeper into Mavrovo National Park. On our way we will stop to visit the monastery of John the Baptist, originally built in the 10th century. We will spend our last two nights in an eco-hotel, built using local natural materials by a Macedonian from a family with a long tradition in construction. In his restaurant, we will have an amazing opportunity to cook our lunch in an open outdoor kitchen featuring traditional elements such as a clay oven and a fireplace. To read about his story, which featured in Vogue magazine, please click here. Day 6: Our optional outdoor activity today is to learn how to walk in steep terrain in snow or ice, and to learn how to walk on glaciers. We will learn how to use harnesses, ropes, an ice axe and crampons. This information will give us the basics of how to choose our gear and what we need when walking in snow or ice or on glaciers. We will divide into groups, choose group leaders, arrange our gear and go through several scenarios of what could happen on icy, slippery terrain. We will also learn the basic techniques of how to stop a fall on snowy or icy terrain. Day 7: On this last day spent in our winter wonderland, we’ll attempt to visit the picturesque hamlet of Galichnik, ascending from 1,270 m to 1,450 m (4,166 to 4,757 ft), where a population of just 2 people lives completely cut off from the world during the winter season. We can reach it by snowshoeing, but it will only be possible to get there if the winter conditions allow it. The village is historically famous for the rebellion that politically opposed the Ottoman Empire, establishing self-governance. This was due to its continuous economic independence, derived from nomadic shepherding and trading: it was recorded at the beginning of the 20th century that the village was inhabited by 3,300 inhabitants and owned almost half a million sheep! We will have our final dinner together back in the village of Janche. Day 8: In the morning we will travel to Skopje to arrive in time to catch our flight. 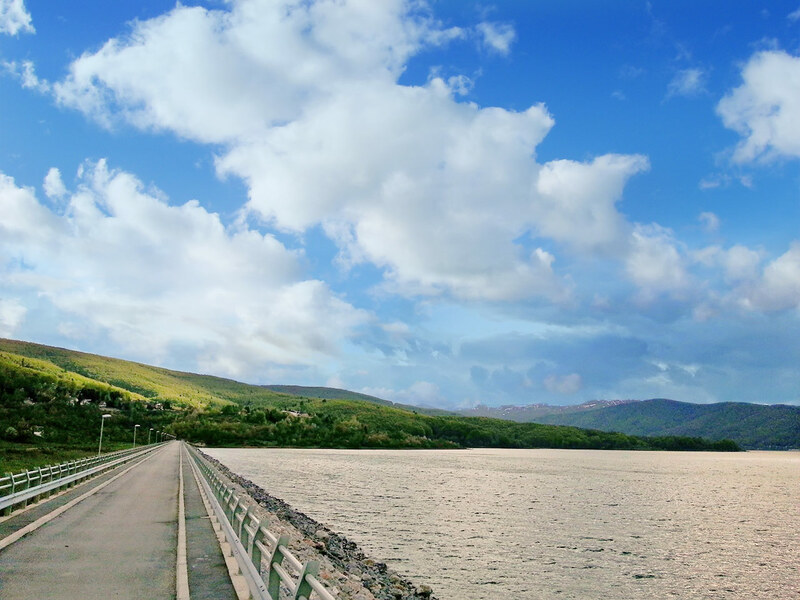 Disclaimer: Parts of the suggested itinerary depend on weather conditions. We reserve the right to switch daily activities based on the weather forecast. • The price of a ski instructor depends on the size of the group. This trip starts and ends at Skopje airport. We can adapt the itinerary according to your choice of flights.